Smartphones and tablets are being used more frequently in the battlefield, and that means that battery power is more important than ever. Soldiers often carry spare battery chargers in the 90-pound combat packs they carry into war zones, but the batteries are often lost or broken. BAE Systems wants to help lighten the load with its new system that lets soldiers plug electronics directly into their clothing. The BAE Systems Broadsword Spine is a harness that can be sewn into a soldiers vest, jacket, or belt that carries a battery pack and hides charging wires. 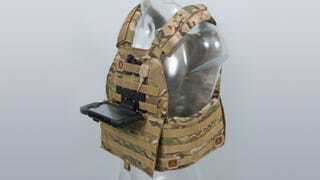 The harness places the battery pack on the small of a soldier’s back and includes eight conductive fabric conduits that can be used to connect to a USB port. The biggest advantage the harness provides is that it replaces the tangled mess of cables that soldiers typically have to deal with. It’s also designed so that it can easily be recharged from a vehicle as well as withstand water, fire, humidity, hard falls, and other treacherous conditions that typical battery packs can’t. BAE Systems estimates that the harness will deliver a 40 percent weight savings for any soldiers that use the system—which is an obvious advantage for soldiers that are asked to carry so much weight into deadly environments. The company has also created an open architecture for its new system so that it can be used by soldiers in combat, first responders in an emergency, or anyone else that would want to modify the system for a specific use. This isn’t the first time that someone has tried to solve the problem soldiers lugging around too many large battery packs. For example, DARPA has funded a propane-powered generator capable of charging 100 UBI-2590 batteries that would limit the number of batteries soldiers would have to carry. The only catch is that the military is slow to adopt new inventions, especially given the Pentagon’s habit of farming technology out to defense contractors. The price of the BAE Systems Broadsword Spine is still unclear, despite the company’s claim that the system was designed to be purchased “in high volumes at low cost.” Unfortunately, the public won’t be able to buy this high-tech clothing apparatus either, so if you’re looking for a better way to keep your battery charged while playing Pokémon Go, your best bet is still a regular old battery pack.